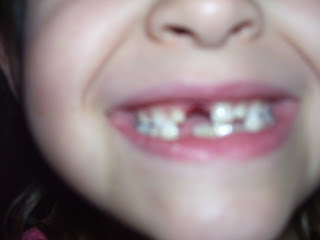 Emily lost her 5th tooth today. It was a very long ordeal. An apple started the incident. 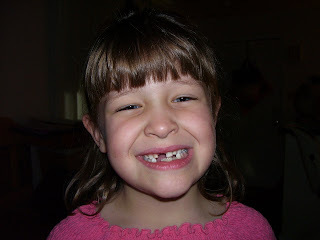 The tooth became very loose at that time. I dare say that there was just a little bit of blood shed. Finally....after threats of not being able to go the the Bonifest with a tooth hanging from her mouth...mommy got ahold of the tooth and tugged. It practically fell out at that time. Well. It is official. Emily is a first grader. FIRST GRADE!!! 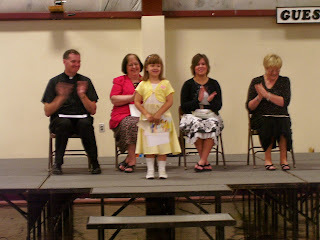 She received her kindergarten diploma this morning. She also received an excellence in music award. Who would have thunk it??? We will be going to Pizza Hut - as is our tradition for kindergarten graduates. Congratulations, Emily! We are very proud of you and love you so much!!! Thank the Lord that these ears are done!!! 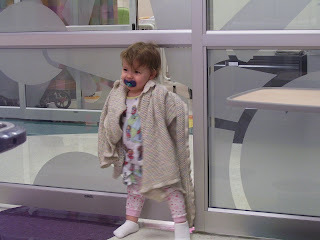 Allison had her "bilateral myringotomy with tubes" (ear tubes) done this morning. 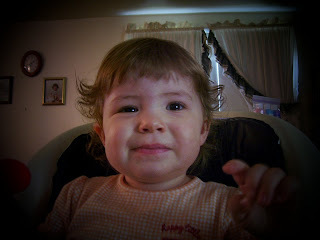 We are hoping to have the same results that Emily had with hers - NO MORE EAR INFECTIONS!!! Allison did well. She woke up a little mad, though. 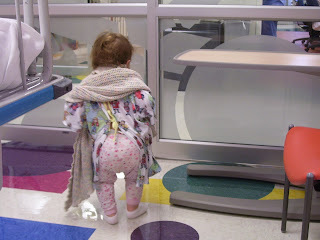 The nurse said that the first thing she did was pull off her moniters and then her socks. She settled down a few minutes after Eric and I got there. Apparently, all she needed was 3 - yes, count them - 3 minutes of anesthesia. We prayed for Allison to do well with surgery, and for Jesus to guide the hand of her surgeon - Dr. Hessler (younger than me, I might add). Thankfully, all is well. Allison had a little bit of a sick stomach when we got home. But she got sick just a little, and then was very hungry.